I enjoy participating in LEGO contests, but I cannot join all of them. Sometimes the timing, my build interest, and the available parts all line up in a way that I can submit an entry. 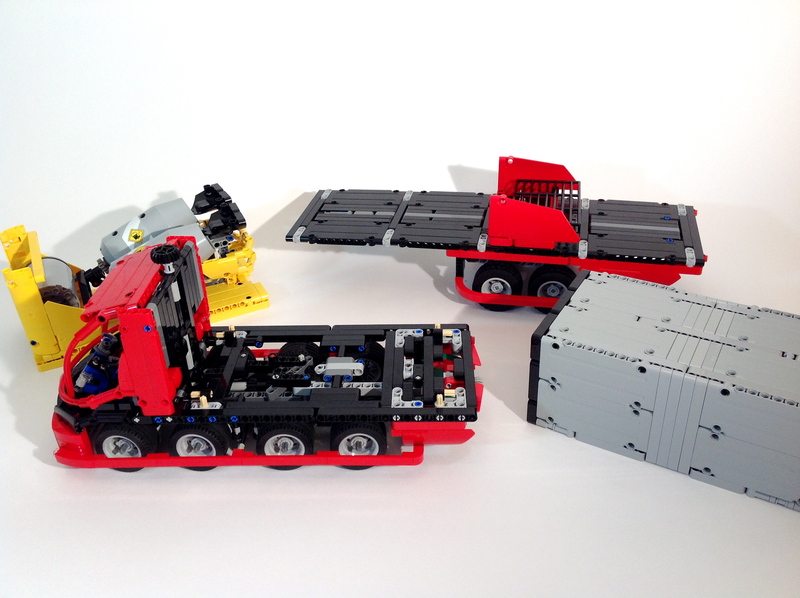 I was able to submit something for the LEGO Technic Mercedes-Benz Future Truck Competition hosted at Rebrick.com because everything fell into place. I hope you enjoy the submission. The full gallery may be seen here (flickr) or here (brickshelf). Various loads to apply to the Athane via the SmartStack System. With this is mind the 2045 Mercedes-Benz Athane has been designed to best fit within this context. While taking this context into account, the Athane prioritizes three values as most important: Safety, Sustainability, and Versatility. Placement of the large methane tanks. ThermoCommLink on right rear bumper. The 2045 Mercedes Benz Athane prioritizes safety, sustainability, and versatility. The 2045 Athane is the most advanced and cost effective truck in our 150 years of truck building experience. As cities become denser and multiple transportation modes are becoming more prevalent, road safety for all road users must be paramount. The Athane’s ThemoCommLink (TCL), located on the right front and right rear bumpers, allow motorized vehicles to communicate to one another. The TCL also detects the heat signature of pedestrians and cyclists. Identification and communication with other users, keeps all road users safer. The driver is seated in the center and forward in the cab to increase vision. Retention of a human driver allows for relational interaction at the job site, and helps the technology make good decisions about varying road situations. The TCL Technology assists the driver so fewer errors are made. The front bumper shaping and full length wheel guards lowers the severity of crashes with non-motorized users should they occur. The Athane uses eight steerable wheels to improve weight distribution and increase city maneuverability. While many manufactures are switching to floatation and hover type drivetrains, this setup allows for unmatched braking control, and removes disruptive air currents to those walking and cycling close to the moving truck. The Athane’s Methane-Hybrid driveline continues Mercedes Benz’s prioritization of decreasing fossil fuel use. The Athane uses electric propulsion using energy stored in the batteries under the cab and bed. Battery charging is done by braking and by a small methane powered combustion engine behind the cab. Additionally, the Athane can be ordered with an induction charger under the cab to work with newly developed induction charging roadways being installed in many municipalities. Methane gas is clean burning, and a significant byproduct of the waste and recycling process currently in place with Octan Rubbish. A partnership with Octan Energy and Mercedes Benz has developed a standard way to reap, store, transport, and fuel the Athane’s regeneration engine using methane gas. 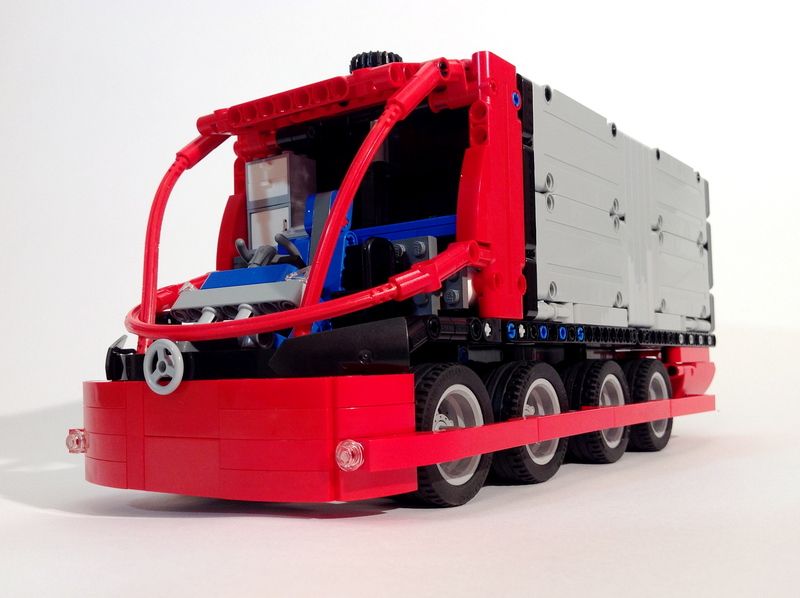 Removable methane tanks are house behind the rear wheels, and in smaller tanks in the cab. Today’s logistics companies are searching for ways to improve versatility and lower cost. The Athane’s SmartStack systems allows for interchangeable bodies, cargos, and applications all with one common truck. The SmartStack system makes it easy to change the load in just minutes. The connection fits the international container standard. Many body work designers are applying this standard as well. 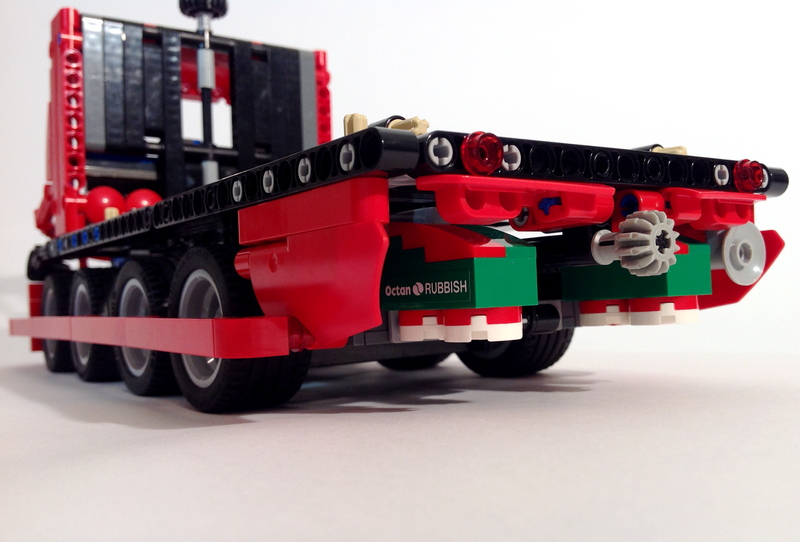 In one afternoon, you can ship a container, deliver a load of concrete, and pull a fifth-wheel with the standard hitch. Welcome to the future. The 2045 Mercedes Benz Athane keeps all road users safer, decreases our harm on the planet, and supports all work tasks needed. The various Methane Tanks which power the regeneration engine. Driver’s seat, steering wheel, video mirrors, bed, and storage. ThemoCommLink is on the left above the bumper. Bottom of the Athane. Note the (L to R) methane tanks, batteries, eight steering axles, and induction charger.